Carpenter, Zuckerman & Rowley are the lead attorneys for plaintiff T.J. Simers. It’s a footnote, to be sure. But a fascinating one for anyone who followed the fall of one-time New Republic star Stephen Glass. Former L.A. Times sportswriter T.J. Simers is suing the paper for $18 million, claiming he was discriminated against because of his age and medical condition. The paper has denied these factors had anything to do with the their dealings with the reporter. 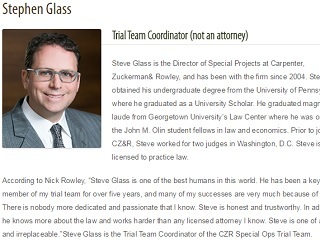 People observing the trial have said that Simers’ legal team includes Stephen Glass, the former magazine writer who was caught fabricating stories for the New Republic and became the subject of the 2003 film Shattered Glass. He graduated from Georgetown law school and has passed the California bar exam, but the State Supreme Court last year rejected Glass’ bid to be admitted to the Bar as a lawyer. He is identified by Carpenter, Zuckerman & Rowley as a non-lawyer trial team coordinator for the law firm. Courtney Rowley is Simers’ lead attorney. 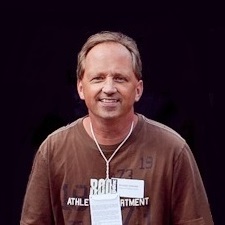 I started my career using a typewriter, early on sitting next to the great New York Times columnist Red Smith when Bucky Dent hit a home run for the Yankees to beat the Red Sox in a one-game playoff. I remember Red typing in “Sports of the Times,’’ then his byline and hitting the keys like some grand pianist while I froze. He was writing poetry, while I was just trying to use words I knew how to spell since there was no such thing as spell-check.